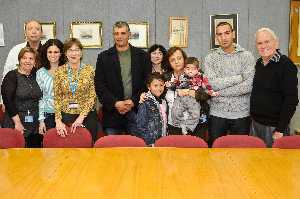 Two Israeli Arab children who received bone marrow transplants a year ago recently met with their Israeli Arab donors at a reunion hosted by the Hadassah University Medical Center. The donors are 2 of 65 individuals who were found to be genetically matched to Arab patients in Israel and abroad, thanks to the Bone Marrow Registry created at Hadassah for Arab patients. Eleven of them have already donated their bone marrow and most of the transplantations proved successful. Hadassah established the registry in October 2008 because 40 percent of Arab patients did not have potential donors and there was no registry for Arabs in the world. It has since been supported by Hadassah Austria and the Kahane Foundation in Austria. Dr. Amal Bishara manages the registry, together with Prof. Chaim Brautbar, who founded the Hadassah Tissue Typing Unit, and Dr. Shoshana Israel, its current director. Over 15,000 Israeli Arabs joined the registry during more than 90 campaigns in Arab villages and cities in Israel. These campaigns included lectures in Arab colleges and public institutions, as well as ongoing advertisements in Israel’s Arab media.